ab108653 is for the quantitative determination of the Cancer Antigen CA125 concentration in human serum. 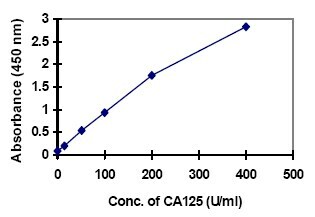 Cancer Antigen 125 (CA125) is a surface antigen associated with epithelial ovarian cancer. In serum, CA125 is associated with a high molecular weight glycoprotein. Published studies have indicated that elevated serum CA125 levels can be found in individuals with serious endometroid, clear-cell and undifferentiated ovarian carcinoma. The serum CA125 concentration is greater than 35 units per ml in 60% of women with ovarian cancer and >80% of patients with disseminated ovarian cancer. The serum CA125 is elevated in 1% of normal healthy women, 3% of normal healthy women with benign ovarian diseases, and 6% of patients with non-neoplastic conditions (including but not limited to first trimester pregnancy, menstruation, endometriosis, uterine fibrosis, acute salphingitis, hepatic diseases and inflammation of peritoneum, pericardium or pleura). Serum CA125 concentration may be useful in monitoring treatment and distinguishing between good response to treatment and progressive malignant disease with poor therapeutic response. To date, CA125 is the most sensitive marker for residual epithelial ovarian cancer. For higher sensitivity in only 90 minutes, we recommend Human CA125 ELISA Kit (MUC16) (ab195213) from our SimpleStep ELISA® range. Our Abpromise guarantee covers the use of ab108653 in the following tested applications. Are dilution linearity studies available for this product? They wish to test in a yet untested species and will be diluting the samples. What diluent would we recommend? Attached is the dilution linearity data for this antibody. The sample can be diluted with the zero standard. saber si se afectaría el resultado o si le serviría? Gracias por contactarnos de nuevo. Me confirman mis compañeros del laboratorio que este kit en principio solo se ha validado con muestras de suero. Es muy probable que sea válido para usar con muestras de plasma, pero al no haberlo testado nosotros mismos no podemos asegurarlo. Lo que le recomendamos al cliente es que antes de usar las muestras haga un pequeño ensayo en paralelo con muestras de suero y de plasma para comprobar la idoneidad del kit con estas muestras. Si el cliente lo desea, también podemos ofrecerle un código canjeable por el valor del kit, para participar en el sistema https://www.abcam.com/abtrial, y mandarnos los resultados de testar el kit con muestras de plasma a nuestra web. Espero que esta información sea de utilidad para el cliente. No dudes en contactarme de nuevo si necesitas cualquier otra información. What is the clone number of the monoclonal antibody in the kit? The two monoclonal antibodies used in the ab108653 ELISA kit are specific for the antigenic B-domain, similar to M-11. Are the antibodiesavailable for sale separately? Unfortunately the antibodies used in this kit are not available for sale separately. I am sorry that I can't be more help in this situation, but please let me know if you have any other questions or if there is anything else that we can do for you. Sorry for the delay in responding to you. I've been dealing with some other stuff. After having discussion with lab and my other colleagues regrettably I have to say we can't provide the product, separate than the kit. I apologize for any inconvenience caused. I would suggest searching the protein in Biocompare website at www.biocompare.com. They have good search facility with lots of companies in their umbrella. I hope this information is nevertheless helpful. Should you have any other question please do not hesitate to ask. We are considering your request as high priority. We will get back to you with all the information soon. I have a question about your CA125 ELISA Kit. perhaps refer me to a source? We prove the CA125 reference standards for this kit in different concentrations 0, 15, 50, 100, 200, and 400 Unit/ml of CA125 6 x 1ml. Unfortunately, currently we are unable to sell the components of this kit separately. However, I have just had a word with my colleague and we may be able to source this purified protein in the next couple of weeks if you are interested. Could you please confirm how much protein you wish use and purchase? I look forward to hearing from you and hope to help you further. Thank you for your enquiry. I can confirm that this kit is sourced externally. They have kindly provided the following information: 1. When this kit was first designed, the antigens used were not pure. So the antigen concentrations was expressed in U/ml. U is an arbitrary assigned number. From then on, most (if not all) other companies manufacturing kits for ELISA detection of the cancer antigens calibrated their standards against the original kit. The standards used in the kit are still calibrated this way. 2, I am sorry it would not be possible to convert from U to ng. I hope this information will be helpful. If you have any further questions, please do not hesitate to contact us.